Louisiana Creole is a term used to describe people whose ancestry traces to the state of Louisiana prior to the territory being acquired by the U.S. in the Louisiana Purchase. These people are mainly of French, Spanish, Native American or African heritage or a mixture of these heritages. Approximately 7,000 European immigrants settled in Louisiana during the 18th century. Creole culture is a blend of many cultures with a rich heritage that has cultural and culinary influence beyond its Louisiana origins. As of 2010, about two million Louisiana Creole live in the United States. The Kingdom of France controlled the Louisiana territory in North America from 1699 until it was ceded to Spain in 1762. In 1718, an early history of New Orleans defined the term “Creole” as someone born in the new colony as opposed to in Europe. This term has evolved in meaning throughout history. In 1803, the Louisiana Territory was sold to the United States for 68 million francs. This acquisition represents the largest gain of territory in U.S. history, as it nearly doubled the size of the country. After the Louisiana Purchase, New Orleans grew rapidly with more Americans, French, Creoles, and Africans, which caused some tension among the groups. The revolution in Saint-Domingue (Haiti) also brought many more people to the region, including refugees, whites, slaves and freed slaves. French was the language spoken in the territory though it later evolved to have local slang and phrases. Over time, the Creoles and Africans created a French and West African hybrid language called Louisiana Creole or Louisiana Creole French, which is still spoken in some regions today. Louisiana Creole is a style of food originating in the bayous of Creole settlements. The cuisine includes French, Spanish, African, Native American, and Caribbean influences, making for a uniquely delicious culinary experience. There are some foods that are considered typically Creole, but it is important to note that many of them have different varieties and ways of preparation, depending on the area’s traditions and preferences and how the recipes have evolved since colonial times. For example, the farther away from New Orleans one gets (towards the south central or southwestern part of the state), the less common tomatoes are in dishes. 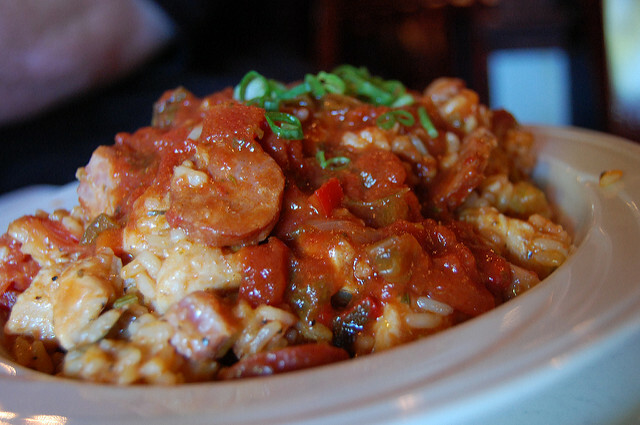 Jambalaya is one famous Creole dish originating in the area, with Spanish roots. It is said that saffron could not easily be found or imported to make paella, so tomatoes and then later Caribbean spices were incorporated into the dish. It is made with meats, vegetables, spices, stock and rice. Jambalaya has many varieties including Creole or “red” jambalaya, found in and around New Orleans, and rural or “brown” jambalaya. There is a jambalaya festival held every year in Gonzales, Louisiana. Another popular food is gumbo, a stew containing onions, bell peppers, celery, meat and/or shellfish and a thickener, which depends on the variety of gumbo. It was developed in southern Louisiana during the 18th century and is the official cuisine of the state. Louisiana Creoles are predominantly Roman Catholic, with some practicing voodoo. Since many are descendents of Europeans, they stayed connected to their culture and continued to practice Catholicism once in the Louisiana territory. 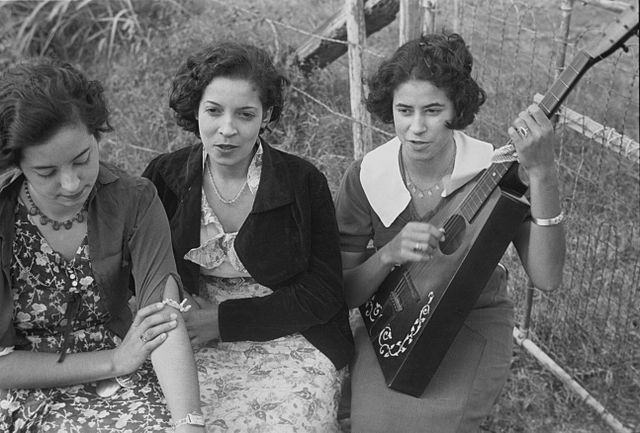 “Zydeco”, a type of music with an upbeat tempo, originated in Louisiana in the early 20th century. Featuring the accordion and washboard, it blends indigenous and Louisiana Creole music and rhythm and blues. Clifton Chenier was known as the “king of zydeco” and made the music popular on the radio. Today, zydeco musicians sing in English, Louisiana Creole, or Colonial Louisiana French. Creole vs. Cajun: What’s the Difference? You may hear both terms and, while similar, they are not interchangeable. Generally speaking, Cajun refers to those with French or French Canadian (from Acadia in Nova Scotia) ancestry who settled mainly in the countryside of southern and south-central Louisiana. Their music is more “folk”-like and food tends to have more spice. Creole refers more to the city people of New Orleans. Literally meaning “mixed,” Creoles are a blend of many different cultures and backgrounds, but most are descendents of settlers in colonial Louisiana from Europe, Africa and the Caribbean. While they have some similarities in their cuisine and language influences and are both rooted in Louisiana since colonial times, they are unique in their heritage and culture.